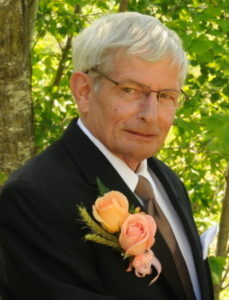 James Dahl, age 74, of New Richmond, WI, died peaceful at home with his family. Jim was a beloved husband, father, brother and papa of 5 grandchildren as well as a business owner. He grew up in St. Paul and came from a large family of 13 kids. He worked at a young age to help support his family first delivering papers then working at a service station where he developed a love for cars. He had a race car and raced at cedar lake speedway and spent time working on his race car with close friends and family. It was while in New Richmond that he met his wife Diane. They married on an unusually warm March 17th day in 1973. They welcomed their first child Jennifer in 1974 and later another daughter Crystal in 1981. He started his painting business after leaving Anderson windows and ran his business for nearly 40 years. He truly enjoyed his work and had an ability to make all things beautiful. He enjoyed spending time with his family whether it was helping them at their homes or going on a vacation to the beach. He knew how to have a good time and had a great sense of humor. He will be greatly missed by his entire family but we will always remember the great times he brought us. Jim is preceded in death by his parents, Norvin and Alice (Ambrosen) Dahl; and siblings, Sandy, Margaret, Judy, Shirley, Robert and Dorothy. He is survived by his wife, Diane; children, Jennifer (Chris) Crowley and Crystal (Tom) Goepfert; grandchildren, Kaelyn and Greyson Crowley and Parker, Reed and Liam Goepfert; siblings, Sharon Niemczyk, Paul (Marge) Dahl, Pauline (Tom) Bear, Roger (EJ) Dahl, Lyle (Lori) Dahl, Ron Dahl; and many nieces, nephews, relatives and friends. A Celebration of Jim’s Life was held on Monday, April 8, 2019 at 4 pm at Bakken-Young Funeral & Cremation Services 728 S Knowles Avenue New Richmond, WI. Visitation was also on Monday, April 8, 2019 from 2-4 pm at the funeral home. Arrangements are with Bakken-Young Funeral & Cremation Services.